If you think the twos were terrible, wait until you feel the tiring threes. At this age, your little boy is a bundle of pure energy brimming with unadulterated curiosity. And that’s a good thing! 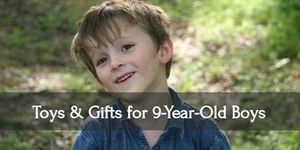 Encourage his inquisitiveness by giving him toys that develop his various skills like creativity, imagination, building, problem solving, and many more. There are so many choices out there to pick from. Review: Let him learn the meaning of hard work with this innovative and creative drill toy. 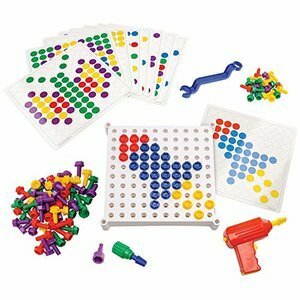 Your child can use the different colored screws to make a lot of different pictures! He can use the reversible power drill, screwdriver, and other kid-friendly power tools to follow the design activity cards that come with this set. Let me tell you now. Your little builder will be playing for hours and hours (oh, what sweet relief!). Think about it, this special design toy doesn’t just improve his design and pattern recognition. It can even help him learn a little bit about math! Review: During this age, your kid is loving possible future career paths. One such career is becoming a builder, and a Ride On Excavator is the perfect gift for him! 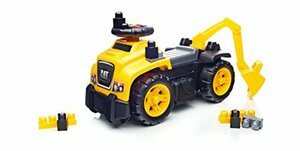 This ride-on toy comes in the classic yellow color that CAT features. It also has a real working excavator arm that can turn in 360 degrees. Not only that! Your little boy can even carry around CAT-themed blocks, and listen to realistic truck sounds. He’ll totally be enthralled by this toy for sure! Review: Is your three-year-old making a lot of ruckus? Instead of letting him continue on making noise, why not train him to make music instead? 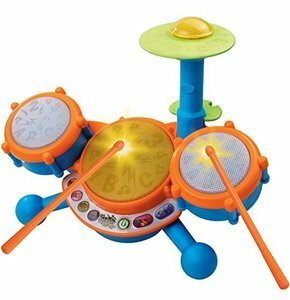 This drum kit is the perfect solution! There are three different drum pads and a cymbal that makes different sounds each. Plus, he can learn different genres like rock, pop, and dance. That’s not including the typical kids sounds like the alphabet song and counting numbers. Review: So, your child may not like the regular jobs like fireman, police officer, or construction worker. Maybe he wants to emulate something a bit more rustic, simple, and relaxing? Well, this fishing set might be what you’re looking for! 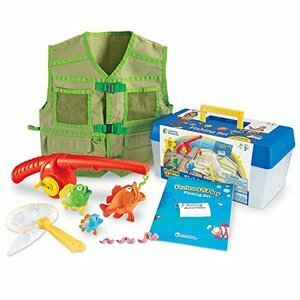 This set includes your little boy’s very own fishing vest, fishing net, fishing pole, and even 3 fishes and 3 worms. Don’t worry! The hook is magnetic so it’s perfectly safe for kids. Your kid can now pretend that he’s out at sea, catching fish to his heart’s content! You can even bring it along when you’re going on an outing. Review: Let’s go back to a classic! Sure, it’s a given that there are lots of train sets available in the market today. You can pick up really inexpensive ones as well as pricy collector’s editions. 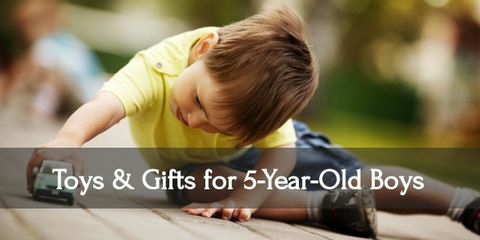 But for your three-year-old, it might be better to get something sturdy yet inviting. This figure-8 set has a 3-piece train that goes around and around winding tracks and up on hill tracks as well. It’s minimalistic yet beautifully detailed to provide endless fun. Not to mention, it even includes townspeople, a fire truck, a bulldozer, and many more different toys that can help your kid’s imagination run wild! Review: One thing that beaches and playgrounds have in common that many kids like is sand. But cleaning up after playing in it is such a chore (trust me, I know!). Kinetic Sand gives your little bou the chance to play about with sand without all the gritty mess. The grains stick to themselves so it still feels like sand but it moves and melts slower and drier than the regular kind. It also has larger grains that natural sand which makes it easier to mold. Plus, it stays completely dry o it won stick to hands, clothes, and even hair! Thank goodness for such magic. 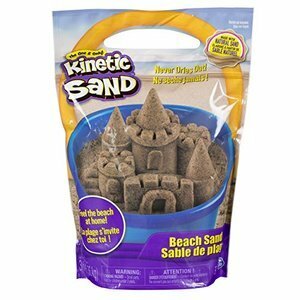 Now you can leave your kid sculpting and shaping multi-colored sand without any worries at all. Review: Oh, this is the perfect party toy! 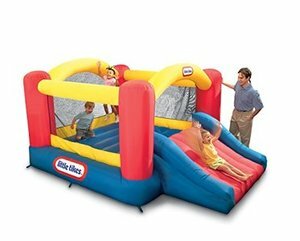 If you love planning kiddie parties or you just have a lot of kiddies running around, the Jump N’ Slide Bouncer will keep them preoccupied all day! With the blower blowing air continuously, your kids can jump, bounce, and run around the pen with no worries. You don’t need to worry as well since the durable material is puncture-resistant and there are 3 mesh slides to keep the kids well protected. Yeah, it does take up a significant amount of space but all the fun and exercise your kids will be getting is definitely worth it! Review: Cars are an all-time favorite toy among boys. You can get generic looking ones as well as toy models of real-life cars. But not all toy cars are actually kid-safe. 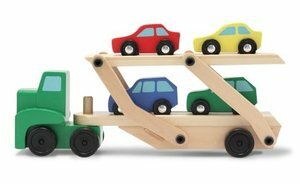 This wooden car set is durable, beautifully designed, and kid-friendly. It is compatible with any standard wooden train tracks. It also has an easy-load ramp so your kid can really feel like he’s out delivering luxury cars. Plus, it just looks so pretty! I wouldn’t have any problem if my kid just wants to keep this toy as decoration. Review: Are you having a hard time getting your little boy to take a bath? I know how hard it is when they just don’t want to stay still! Well, get them this toy. 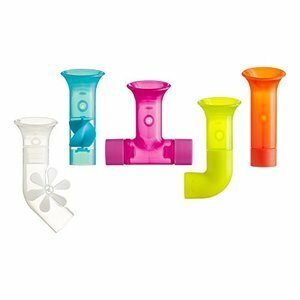 These bath pipes are simple (which is the main reason why they’re so magical!). All you need is water and your little boy can have fun looking at the many ways that it can go through the pipes. Just remember to stick them in the wall so the water can go back to the tub. It’ll keep him busy while you try to finish all your bath routines (guaranteed). Review: Teddy bears are another type of stuffed toy that many kids have. But even these simple toys can also evolve. Just look at Parker and his mobile app! 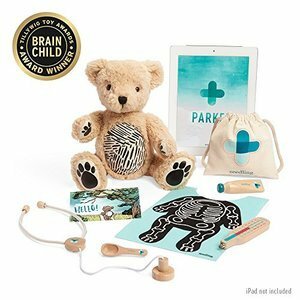 All you need to do is download Parker’s free app and a whole new world of Pretend Doctor play can be experienced by your little boy. 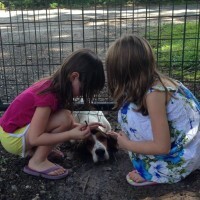 Help Parker get better from a sore tummy, a hot fever, an itchy throat, and many more. He can even use special tools like a thermometer and the like. Really, kids today are so lucky. Who would’ve thought that teddy bears can be so much more, right? At this age, your little boy is understanding the world around him so much better. He’s more observant and receptive to stimuli and experiences. It won’t be surprising if he wants to copy what daddy or mommy does for work. So encourage this trait to the fullest! 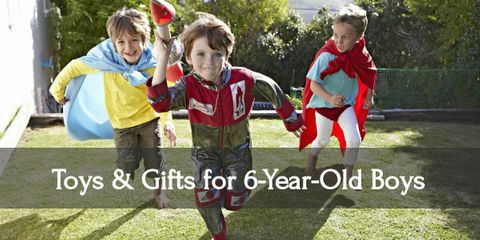 Get him toys that can help him appreciate his environment and exercise his imagination all the more.